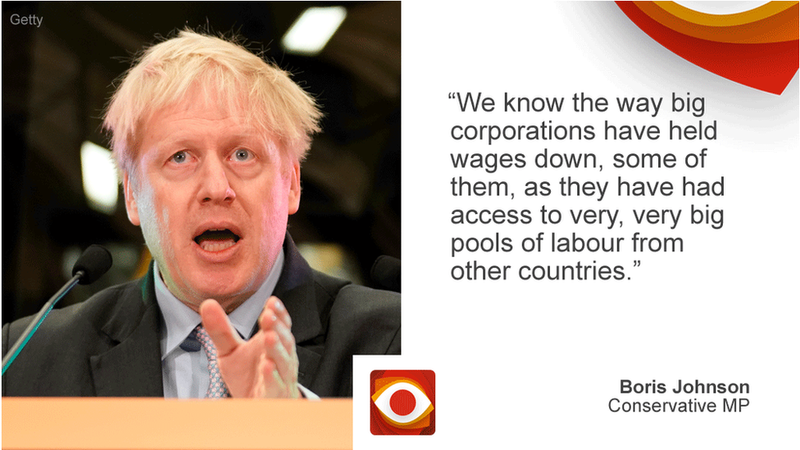 In a Brexit speech, Leave campaigner and former foreign secretary Boris Johnson said some big corporations had held wages down because they had access to so many workers from other countries. He said the UK needed to think "about how we control immigration". So, has it affected wages? We'll start by looking at European migrants, because migration from other countries is already restricted, whereas workers from other European countries benefit from freedom of movement. The Migration Advisory Committee (MAC), an independent body that advises the government, published a report in September 2018 about the impact of migration from the European Economic Area (EEA), which is the EU plus Iceland, Liechtenstein and Norway. Remember that this sort of research is difficult to do - comparing what actually happened with what might have happened is complex and there is considerable uncertainty about the conclusions. The MAC found there was some evidence that immigration depressed the wages of lower-skilled workers while inflating those of higher-skilled workers, but added that the impact was generally small. When it talks about a small impact, it looked at the period from 1993 to 2017, over which time average earnings for the lowest-paid rose by 55%. Using economic modelling, they estimated that - if there hadn't been European migration into the UK - that rise would have been around 5% higher. It added that more research was needed to find out if there had been any impact on self-employed workers. The MAC concluded that other factors had a greater impact on wages, with all workers having done badly since the financial crisis. Real wages are still struggling to rise above where they were in 2008, but lower-skilled workers have done marginally better due to the minimum wage rising faster than average earnings. The assertion that immigration put a small amount of pressure on wages for lower-skilled workers is supported by a paper from the Bank of England, which also looked at non-EU workers. It found there was no difference in the impact of EU and non-EU workers. The Bank of England said that the biggest impact had been for semi-skilled and unskilled workers in the services sector, where they estimated that a 10 percentage point increase in the proportion of immigrants working in the sector would have been associated with a 1.88% reduction in pay. A 10 percentage point increase in immigrants working in a sector is a lot. The Office for National Statistics estimates that between 1997 and 2018, the proportion of non-UK nationals working in the UK rose from 3.7% to 10.7%, an increase of seven percentage points over 21 years. But, of course, that is an overall figure, and the impact on some individual sectors and regions will have been considerably bigger. For example, the MAC said that about a quarter of workers in food and drink manufacturing in 2016 were EU nationals. The National Farmers' Union estimates that in 2017 there was a 9% increase in wages compared with 2016, reflecting a shortage of seasonal workers. It is by definition hard to find figures on the extent of the hidden economy and how much it uses migrant workers. Research by the Salvation Army quoted by the MAC found that EEA victims of labour exploitation were most likely to work in a carwash, but a significant proportion were also involved in factory work, construction and cleaning. It did not give any figures for this impact. Reality Check: Do foreign workers take jobs and cut wages? Reality Check: Would staying in the EU reduce wages?